Originally published in the 9/5/16 edition of The Cordova Times. When asked about the similarities between Cordova and her home in Russia, she laughed as she answered, “the cold and rain.” It is another similarity, however, that has brought her all the way from the Russian Far East to work here in Cordova—salmon. Biologist Albina Kanzeparova is the newest addition to our research team at the Prince William Sound Science Center, where she will spend two and a half months working predominantly with research ecologist Dr. Pete Rand. Through a grant from the Trust for Mutual Understanding, an NGO that supports US/Russian scientific and cultural exchanges, Kanzeparova will work with Science Center researchers to gain insight into studying the interactions between wild and hatchery-raised salmon. Though thousands of miles from Cordova, Kanzeparova conducts research in a region of Russia that houses many of the same plants and animals—giant brown bears, orcas, wild berries and of course, salmon. 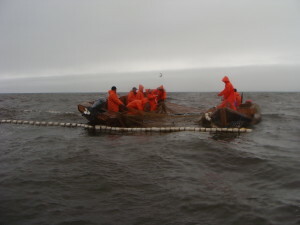 The way that salmon are harvested, however, is very different. Dr. Rand noted that the commercial fishery in the Russian Far East “is like the fishery that used to be here in Alaska before statehood,” as fishermen utilize trap nets set close to shore, rather than seine or gill nets. 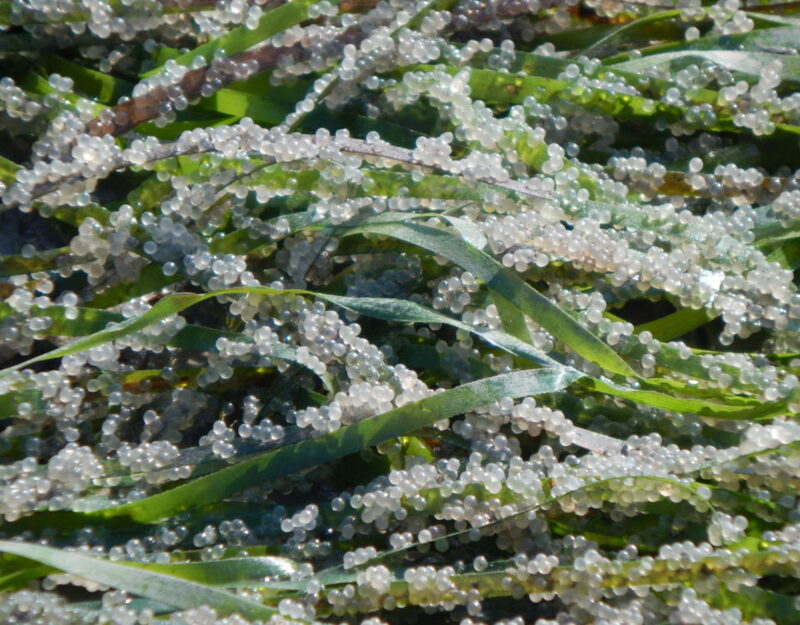 Compared with Alaska, hatcheries are also relatively absent in the region. Approximately five billion salmon are released from hatcheries into the North Pacific each year, with approximately 700 million coming from Prince William Sound. With such a large influx, there is much concern among the science community because, as Dr. Rand explains, “we still have very little understanding how wild and hatchery salmon interact in streams and the ocean.” Russia plans to increase the number of hatcheries along their coasts in the coming years, and through scientific collaboration, Dr. Rand hopes to instill an appreciation for the potential risks that hatcheries could have on wild salmon stocks. He notes that while “there are definitely benefits to hatcheries, […] it is important to recognize the biological differences between hatchery-raised and wild fish.” He hopes that current and planned Russian hatchery programs will consider the precautionary measures available to help protect wild salmon. 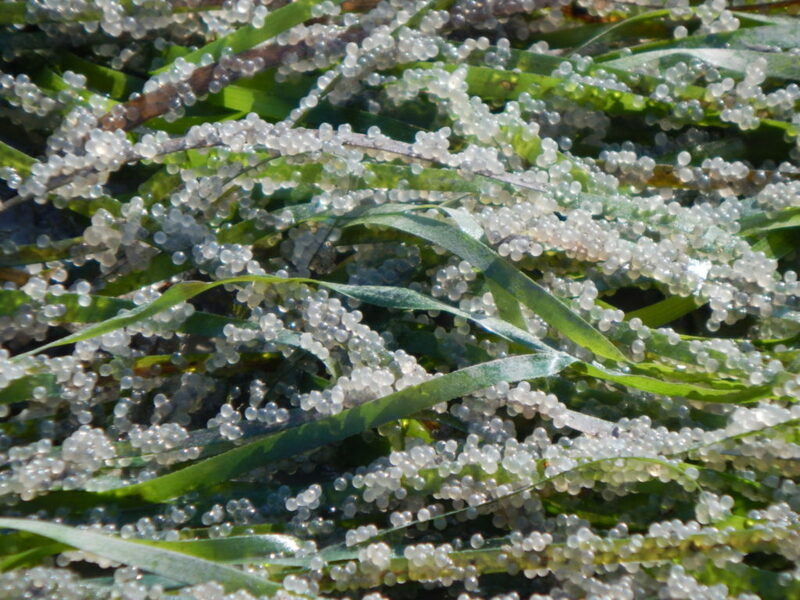 For example, Alaskan hatcheries were sited in locations that aren’t too close to wild salmon spawning streams. They also mark the ear bones, or otoliths, of their salmon to distinguish them from wild salmon providing useful information for fishery managers and scientists. While in Alaska, Kanzeparova will work both in the laboratory and out in the field. So far, she has spent much time in the lab, learning how to prepare salmon tissue for isotope and energy density analysis, which are techniques she can use upon her return to Russia. 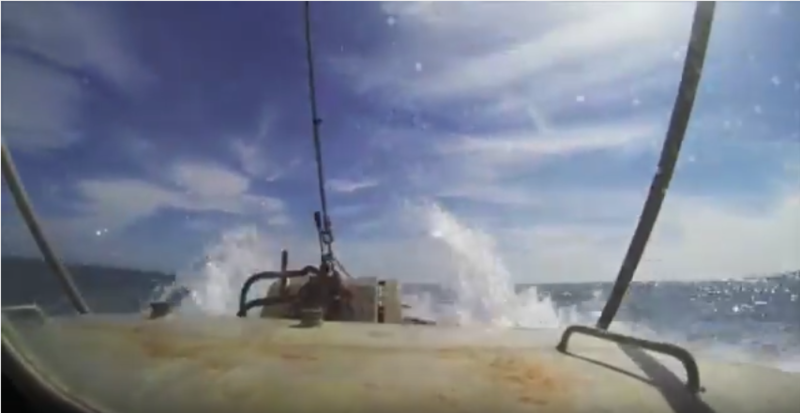 Later in August, she will set out with our Hatchery-Wild Salmon Project to help crews collect salmon data in remote areas of western Prince William Sound. 2016 marks the fourth year of this project led by the Alaska Department of Fish and Game, which aims to determine whether there are differences in fitness, or productivity, of wild pink salmon in the presence of hatchery-raised fish that enter spawning streams. 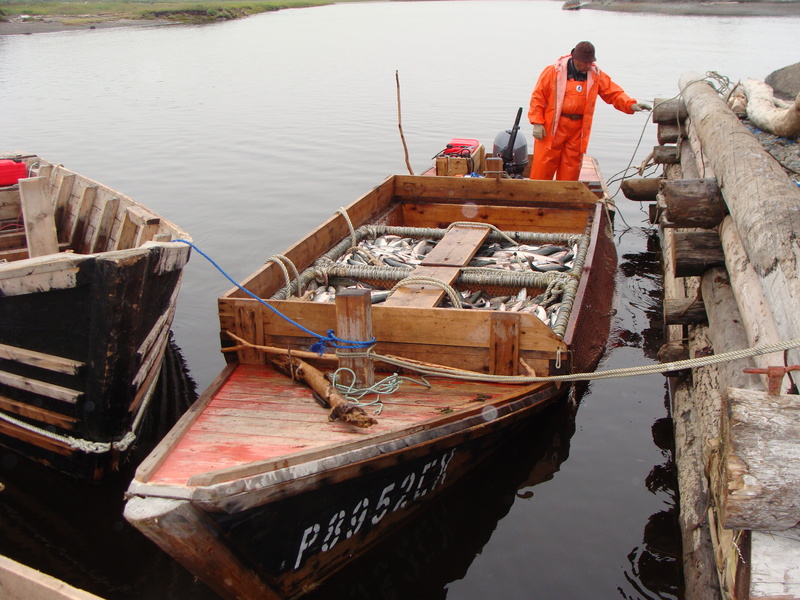 Conducting salmon research in remote areas is nothing new for Kanzeparova. 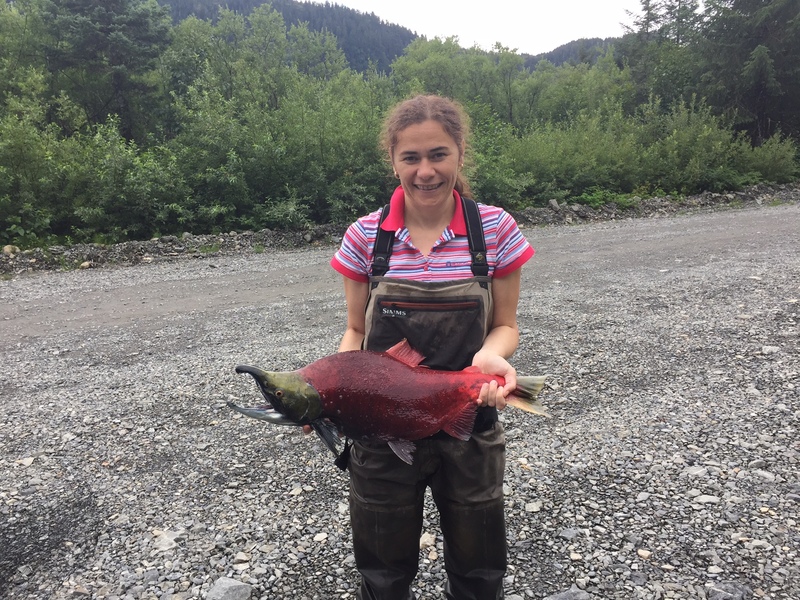 In Russia, her job with Khabarovsk TINRO, a regional government fisheries agency similar in function to Alaska Department of Fish & Game, involves summer field work at a remote field station about 450 miles from the nearest city. This field station is located in northern Khabarovsk Krai, in a remote village called Chumikan, at the mouth of the Uda River. The town is home to a small community of indigenous Evenk people who inhabit areas in the Russian North and throughout a broad swath east of Siberia between Lake Baikal and the Amur River. Throughout the summer, she collects biological data on pink and chum salmon to inform TINRO’s management decisions and population forecasts for the commercial fishery. Dr. Rand hopes that Kanzeparova will be able to apply her experiences with the Alaskan Hatchery-Wild Salmon Project to her research in Russia, especially as the prevalence of hatcheries in the region increases. 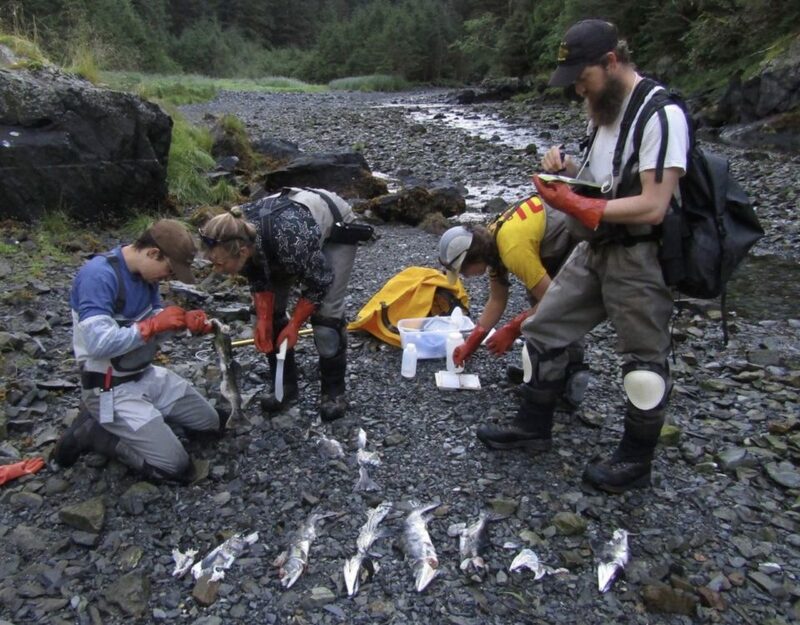 The foundation for this exchange was laid years ago, as Dr. Rand has spent much of his career engaging in domestic and international salmon research, compiling the status of different salmon species across the North Pacific. Through this research, Dr. Rand has worked closely with a Russian salmon expert and Kanzeparova’s supervisor, Dr. Sergei Zolotukhin. Together, they have conducted research on a salmonid species endemic (only found in one region) to certain regions in Asia and inhabits many of the same rivers Kanzeparova studies in her research. These fishes, known in Russia as taimen, can reach upwards of 6 feet long, live for over 30 years, and hold the title of being the largest salmon species in the world. Though salmon are relatively well-studied compared with other fishes, there remain many important questions about their life histories in the North Pacific. Dr. Rand hopes that this collaboration will add to the knowledge exchange necessary among researchers across this broad region. Fish do not adhere to national boundaries, and scientists shouldn’t either. In order to ensure the health of our future oceans, we must work together.